Get Your Kids To Eat The Healthy Way! With kids becoming fussy eaters these days, you must be struggling to help your children meet the requirement for all essential nutrients. As concerned mothers, you must resort to smart ways of getting your kids to eat healthy. By doing so, you can make a huge impact on your children's diet, while allowing for some of their favorite treats whenever possible. 1. Make a solid start. Once your kid completes 6 months of breast feeding, introduce them to liquids and semi solids gradually. 2. Cook more meals at home. This ensures your meals are wholesome with good carbohydrates, healthy proteins and adequate fats. 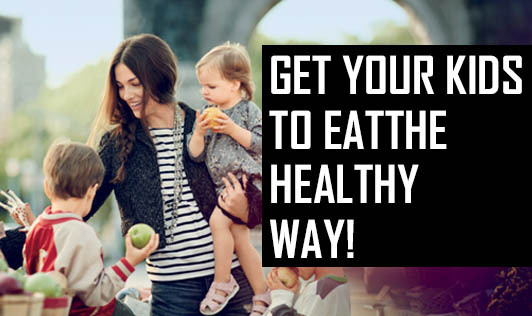 At the same time, your child gets to know the importance of healthy eating. 3. Make your child know the importance of milk and milk products which aid in healthy growth and development. 4. Offer new foods only when your child is likely to get hungry. Serving new foods at this time can increase their acceptance. 5. Get your child involved in cooking. This will make your child more interested in eating what they have created. 6. Make snacks healthy. Keep lots of fresh fruits and vegetables as snacks. Place yogurt, nuts and low fat cheese as topping options. 7. Cut down on salt and sugar. Many recipes taste good with less salt and sugar. 8. Limit your child's intake of beverages. Beverages can fill their appetite however healthy they might be, limiting their intake of solid foods and depriving them of essential nutrients. 9. Be role models to your kids. If you are choosy about your food, it's high time to incorporate varieties into your diet as your child will imitate what you do. 10. Be flexible. Anything in moderation is alright. A special treat once a week or even once a day won't do any harm.